Caroline Bartlett is a textile designer and printer who draws inspiration from architectural elements, myths, legends and aspects of various cultures around the world. She is interested in the way in which textile processes play a role in our concepts of organisation, structure and community. Bartlett is also interested in language and the written word as a system of knowledge, central to the Western view of the world, which gives exclusive access to those who are able to decode it. For the 62 Group of Textile Artist's Fortieth Anniversary Exhibition 'Textiles in Context' held at the V&A, Bartlett explored the relationship between 'text' and 'textiles'. 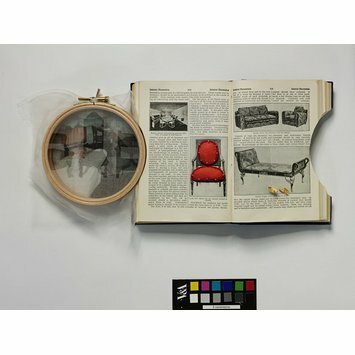 This complex arrangement of a 1934 encyclopaedia, prints and embroidery hoops explores the idea of the V&A as 'an encyclopaedia of treasures'; like encyclopaedias, its content and presentation reflect governing ideologies and hierarchies of taste, demonstrating the way in which society and perception change over time. The Art Nouveau chairs refer to the donation of 38 pieces to the V&A from the Paris Exposition Universelle in 1900, reviled by critics and 'banished' to the Bethnal Green Museum. 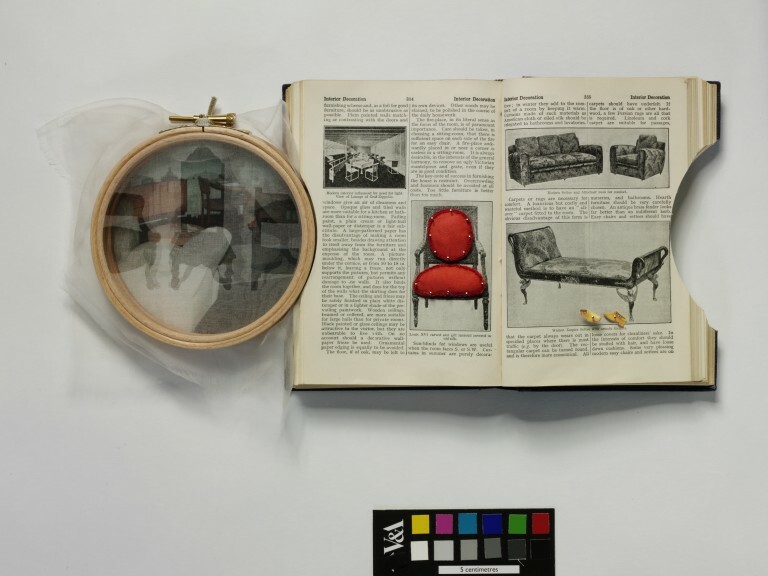 Complex arrangement of 1934 encyclopaedia, printed silk crepolene, pins and wooden embroidery hoops. The crepolene is printed with images of chairs and attached to the embroidery hoops. The hoops are arranged either side of the encyclopaedia which has a fabric chair attached to an open page. A pair of cut out paper shoes are fixed with pins on the opposite page. Attribution note: Produced specifically for Textiles in Context: 62 Group of Textile Artists exhibition in Gallery 101. Artists brief to choose an object or element(s) that particularly inspire them and make a piece of work as a direct response to that subject.